Being a fighter is not an easy task. They have to meet high demands on physical fitness, mentality and intelligence. Working in a small cockpit with extreme conditions is not suitable for all women who choose the military as a career. Female fighter pilots were not allowed in most countries until the 1990s, and some countries have never had one. Although women were allowed to join the Air Force as early as 1993, they were prevented from pursuing their careers until 2015 as career pilots. Women, however, have proven to be notable in some of the Luftwaffe's toughest positions. 0 female fighter pilots who dared to become a modern jet fighter pilot to the Sky Warrior. 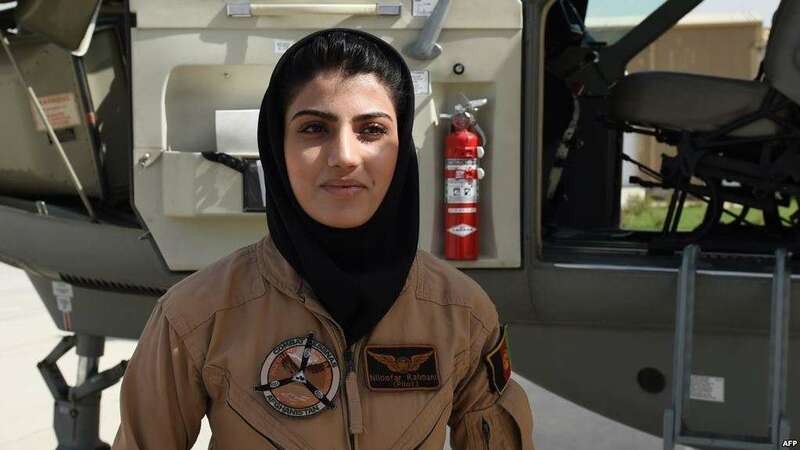 She is the first Air Force Airplane Aviator in Afghanistan's history and the first pilot of the Afghan Air Force. The successful story was followed by a controversial story. Most Taliban terrorists disagreed and wanted to punish them. Some of their family members also threaten to kill them because it violates Afghan traditions and rules that women can not serve in the military. She began her training at C-130 at the US Air Force in 2015 and completed the program in December 2016. In April 2018 she was granted asylum by the United States Government. See also; The list of the 10 hottest women's officers in the world. Nicola Baumann, born March 10, 1985, was the second female fighter pilot in the history of the Luftwaffe in 2007. She was assigned to the 322nd Squadron in Bavaria and flew Tornados and Eurofighter Typhoon. In 2012 she became an Instructor Pilot at the Euro NATO Joint Jet Pilot Training (ENJJPT) with the 459th Flying Squadron. She also completed her flight training as a pilot of the Eurofighter Typhoon in 2015. The Marine Corps captain, Katie Higgins, made history when in September 2014 she became the first female pilot on the Blue Angels team. Blue Angels is the famous US Air Demonstration Squadron. She received a BA in Political Science from Annapolis in 2008 and a Masters Degree in International Security from Georgetown University before completing her aviation training at Naval Air Station Pensacola. As a married woman with two children, her performance in flight accounting was amazing. Born in 1986 in Chengdu, Sichuan Province, China. Yu Xu was the first certified Chinese woman to fly China-made fighter jet Chengdu J-10. She joined the Air Force Air Force Air Force College of PLA (People's Liberation Army) in 2005 and graduated from high school in 2009. Yu Xu was a member of the aerobatic team on August 1st. Unfortunately, the potential pilot died on November 12, 2016 during an aerobatic training. She was killed in a parachute accident when her jet crashed near Tangshan, Hebei Province. Born in 1968 in Racine, Wisconsin. Carey Lohrenz is the first female F-14 Tomcat pilot in the US Navy. She graduated in 1990 from the University of Wisconsin. In 1991, Lohrenz graduated from the Aviation Officer Candidate School at Naval Air Station Pensacola, Florida. In the same year, she receives advanced jet training at Naval Air Station in Kingsville, Texas. She received follow-up orders to the F-14 Fleet Replacement Squadron, Fighter Squadron 124 (VF-124) at Naval Air Station in Miramar, California. Born in 1979 in Abu Dhabi. She is the first female fighter pilot of the United Arab Emirates Air Force. In 2007, she joined the Khalifa bin-Zayed Air College of the United Arab Emirates Air Force and completed her training as an excellent pilot. In Arabic aviation she writes history as a proven pilot. In 2014, she flies the F-16 Fighting Falcon Block 60 and heads airstrikes by the UAE Air Force against the IS against Syria. The successful mission became an inspired story for the Arab female teenagers who dreamed of becoming a pilot. As the first Asian female fighter pilot of the Russian MiG-29 declares. Patricia Yapp is also the first female fighter pilot in the RMAF (Royal Malaysia Air Force). She was born and raised in Sandakan, Sabah, East Malaysia. In 2000, she graduated in aeronautical engineering from Universiti Teknologi Malaysia. After her flight training in 2002, she opted for a fighter pilot and flew for four years with the Aermacchi MB-339. She then became operational and tactical pilot pilot of Squadron No. 17/19 in Kuantan flying the MiG-29N Fulcrum. Captain Campbell was born June 6, 1975 in Honolulu, Hawaii, USA. After graduating from the Air Force Academy in 2003, Campbell was one of only 50 female fighter pilots in the USAF. In 1997, she graduated from the United States Air Force Academy with a Bachelor of Science degree from the University of Reading, UK, and a Masters in Business Administration from Imperial College London, UK, during a Marshall Scholarship. Captain Kim Campbell served as the A-10 pilot of the 75th Expeditionary Fighter Squadron in the Iraq conflict. Her aircraft A-10 was disastrously hit by AAA (Anti-Aircraft Artillery) when she flew a combat mission to Baghdad to assist American ground forces on April 7, 2003. With determination and excellent flying abilities, she manages to safely return the aircraft to A-10 damaged at the base. For this action in aerial combat Capt. Campbell the Distinguished Flying Cross.